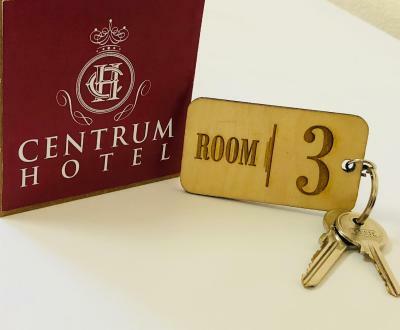 Lock in a great price for Centrum Hotel – rated 8.9 by recent guests! Owner was very welcoming and polite. Room was clean and had great amenities. I would highly recommend this hotel. Its great position near center is another bonus to visit this place. Lokacija odlična. Komotne i čiste sobe. Predivno osoblje. 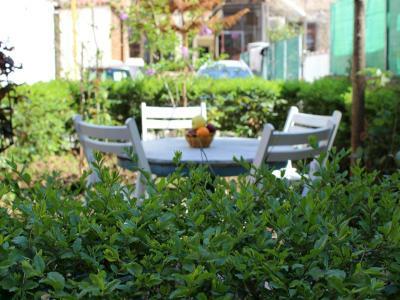 You cannot find a better location in Tirana for the same money as Hostel Fredi. The host and his son were super nice and helpful; he even drove our car up to the hotel after I lost any hope to find it myself on a car and left it on the main street to walk to the hotel and ask for assistance. The breakfast was fine. Wonderful place in Tirana. Staff is super friendly, fantastic breakfast. We were able to leave our bags for a few hours before an afternoon bus, which was a huge help. Absolutely recommend. - Location is very good. 5 min. to main square by walk. - The room was clean. - The hosts Fredi and his son were very friendly and helpful. - It is possible to park the car in the street for free as well as in the paid parking lot next to the hostel. The owner is such a sweet and nice man. His son speaks very good english and can help you get around the town. The place is nice and clean and in a very good location. Not very easy to find though. They also have nice little green space for breakfast near the apartment. We loved the stay! Very nice and friendly family, good breakfast, they also managed to let us have an Albanian burek for breakfast as we wanted to try something traditional. 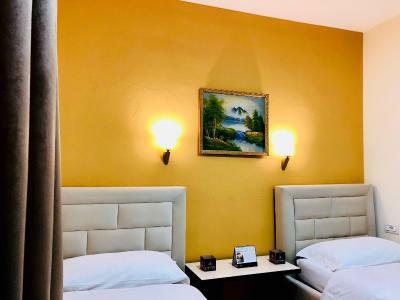 Centrum Hotel This rating is a reflection of how the property compares to the industry standard when it comes to price, facilities and services available. It's based on a self-evaluation by the property. Use this rating to help choose your stay! 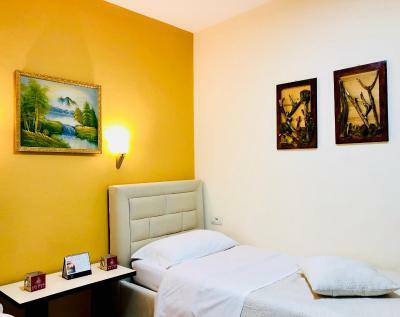 One of our top picks in Tirana.Featuring free WiFi, Centrume Hotel is set in the center of Tirana, just 1,000 feet from the Skanderbeg Square. It offers air-conditioned rooms and a garden with a seating area. 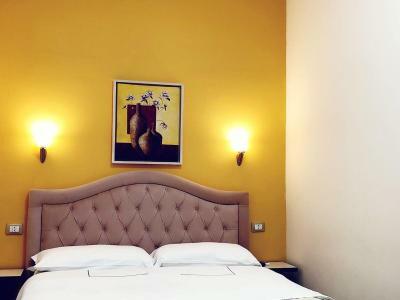 All rooms consist of an LCD TV with satellite channels and a fridge. Most units have a balcony, while each provides a private bathroom with a shower. Restaurants and bars are a short walk away. National History Museum is 1,000 feet away. 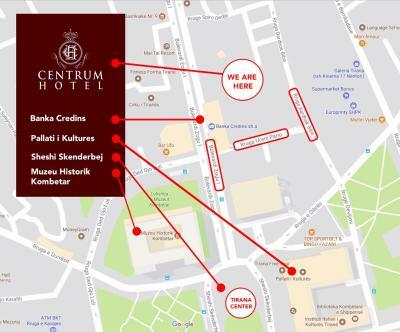 A bus station is 1,650 feet away, while Tirana Airport is 8.1 mi from the Centrume Hotel. This property is also rated for the best value in Tirana! Guests are getting more for their money when compared to other properties in this city. When would you like to stay at Centrum Hotel? This unit has a balcony, air conditioning and a private bathroom. Private parking is available on site (reservation is needed) and costs EUR 3 per day. 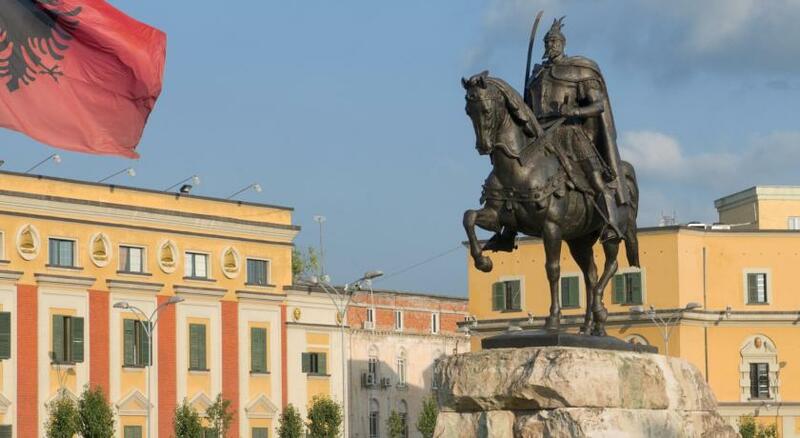 Located in the center of Tirana the capital city of Albania, well-known Skanderbeg square. I was raised in these neighbour and passed all my childhood here. House Rules Centrum Hotel takes special requests – add in the next step! Please inform Centrum Hotel of your expected arrival time in advance. You can use the Special Requests box when booking, or contact the property directly using the contact details in your confirmation. 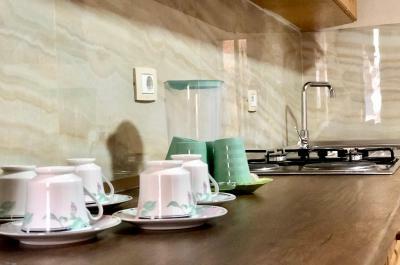 Excellent situation, just 5 minutes from the main square and from the Natural Sciences University. The personal gives you all the information you need to move for the city and to enjoy. They recomend you good food restaurant and night clubs. Very friendly and kind people both Eno and his father. 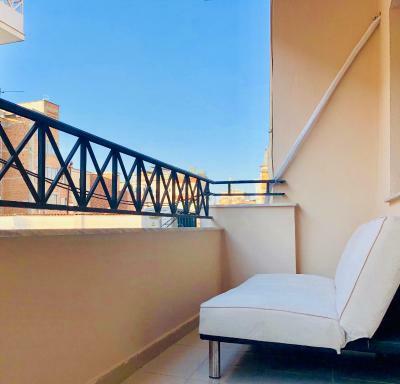 Location of the property was right at the heart of Tirana, meaning it only takes you a few minutes to get to the bus stop or the nearest grocery shop. Staff working over there was extremely friendly and helpful, always happy to assist with everything. The room itself was quite spacious and bright, also the bed was super comfy and sizable. The staircase in the building was very clean and tidy with a neat lift leading up to the room. No shower door, so water everywhere when you shower. reception was closed when we arrive to hotel, it is out side of the building. The person on the reception was so kind and helpful. Rooms are clear. Its all excellent. Hospitality & Comfort. Limited English TV options, maybe would have been nice to have some coffee making facilities in the room - although coffee offered free of charge in the reception. Great location - a very short walk to the main square. Rooms very large and warm. Comfortable beds and good self-catering options for those on a budget. Highly recommended stay. Friendly staff, very helpfull. Comfortable beds and the room was always clean and nice. Really enjoyed the stay. Staff very friendly, would happily stay there again. Great and friendly staff, location excellent, cleaning every day and very comfy beds. Nothing to complain about! Thanks. Booked a double room but got a twin. Could do with curtains as it was light at 6am.